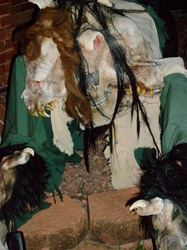 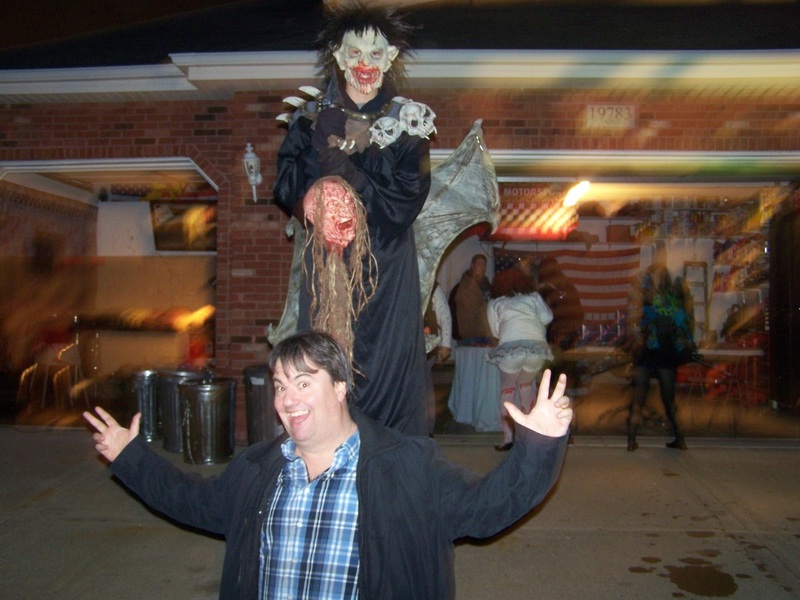 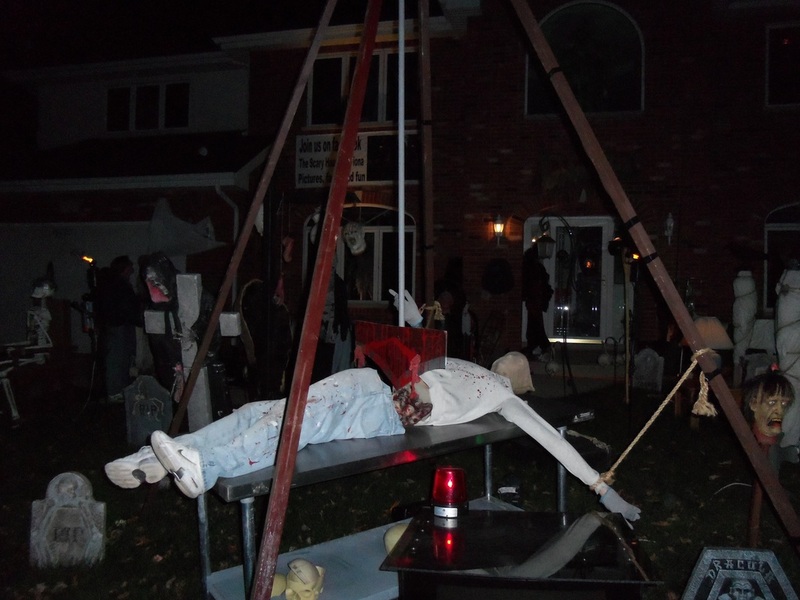 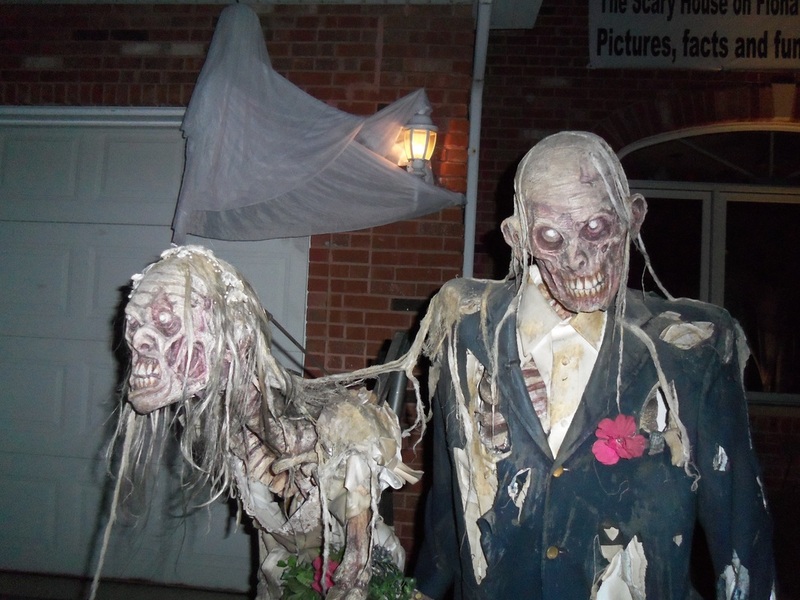 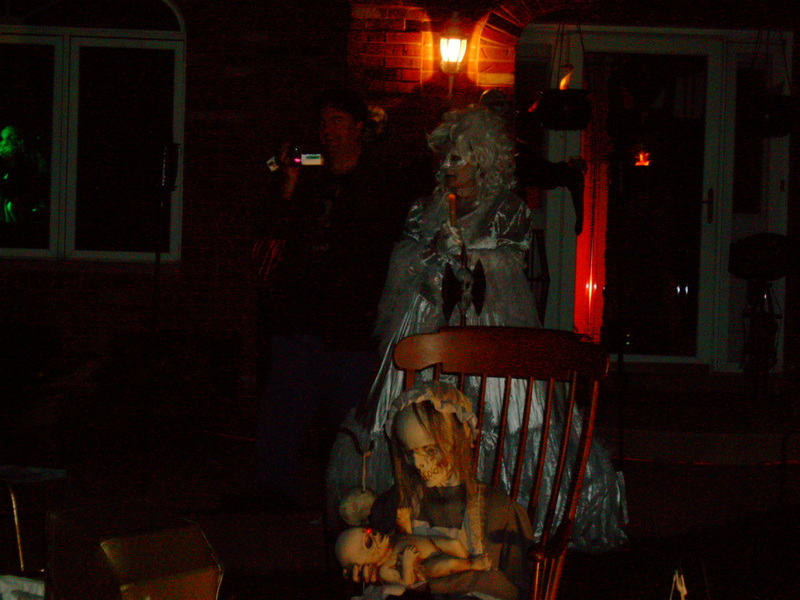 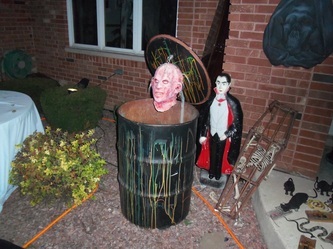 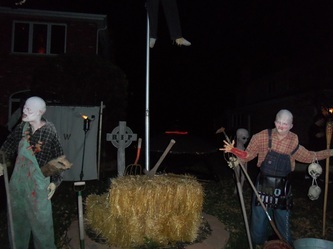 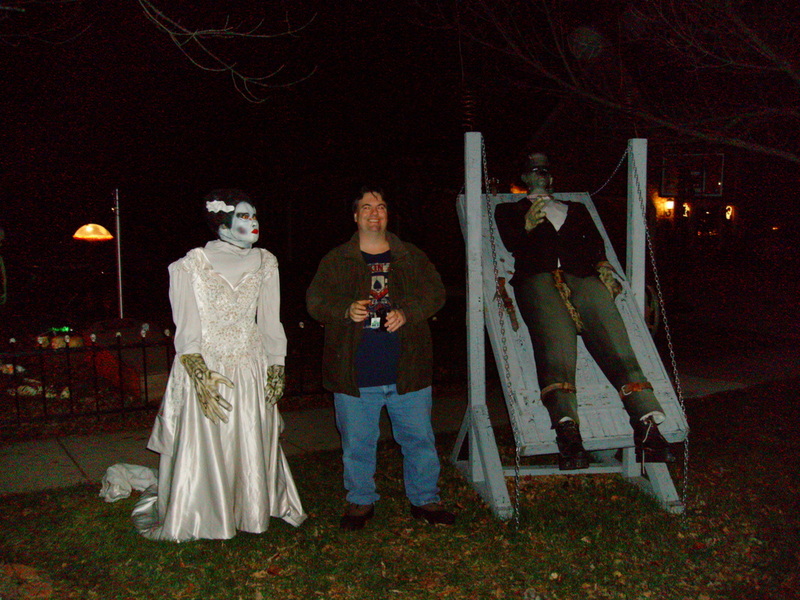 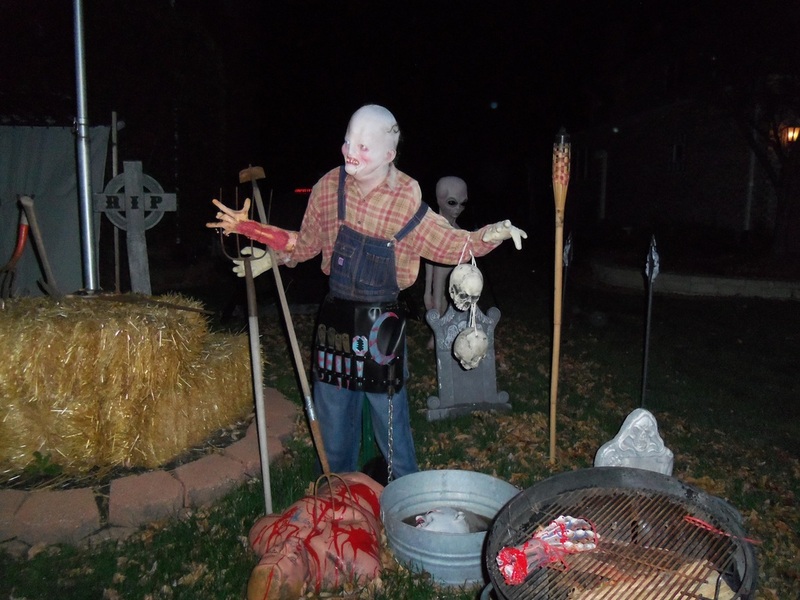 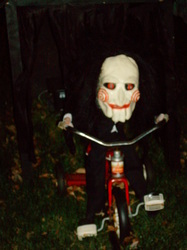 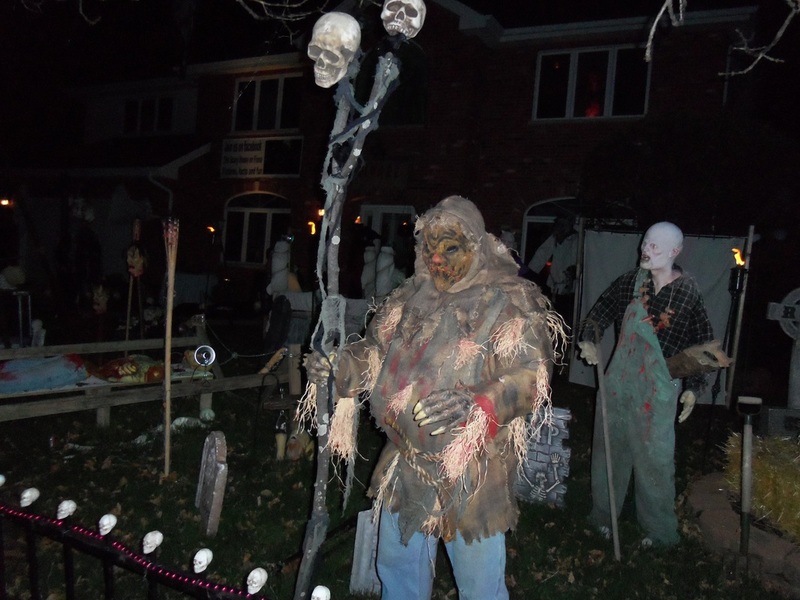 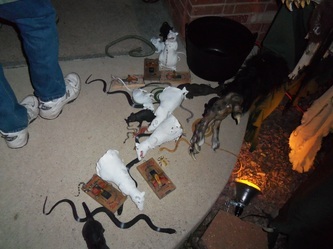 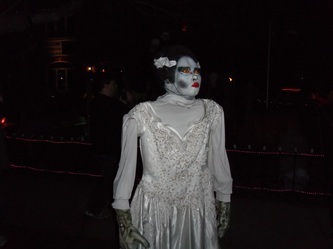 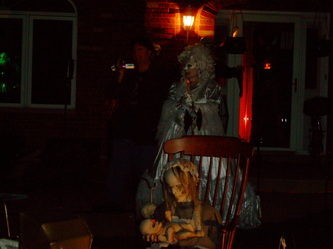 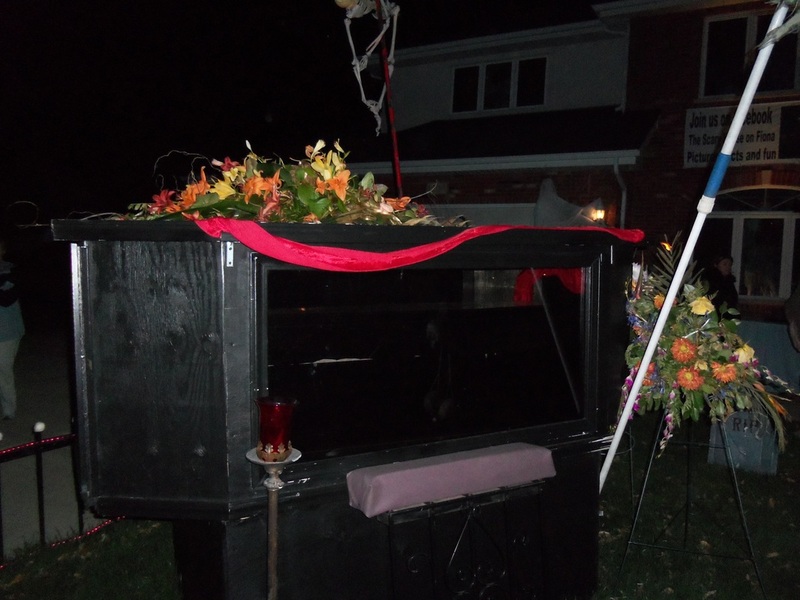 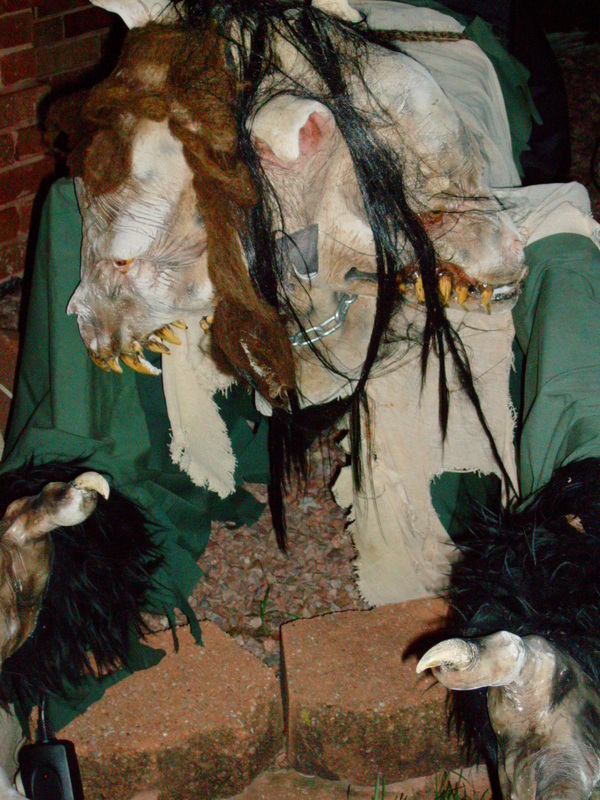 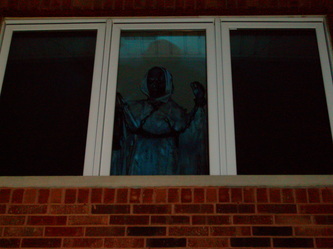 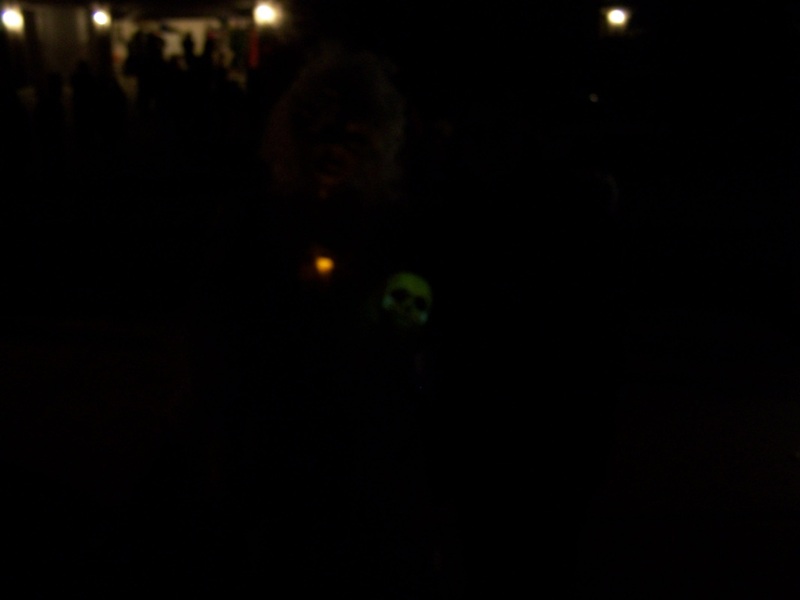 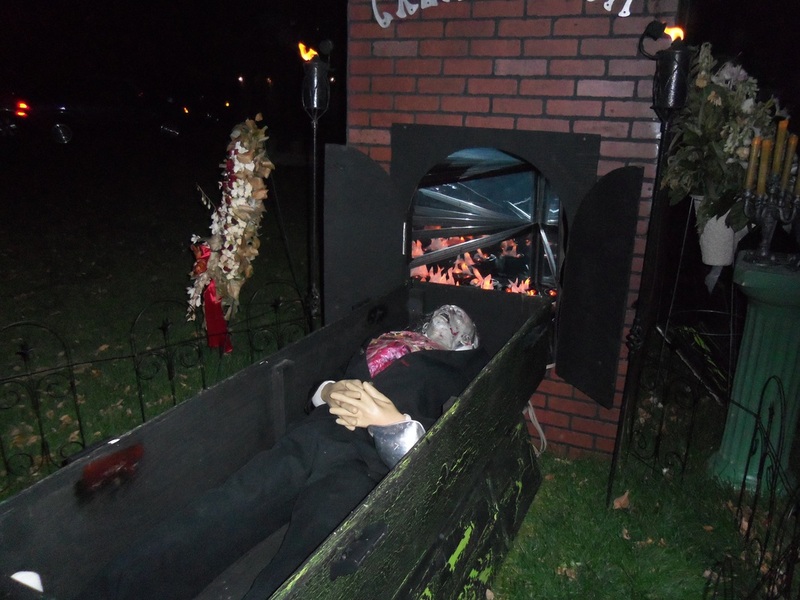 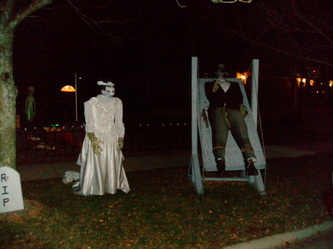 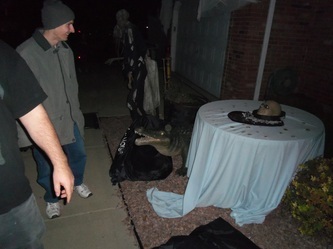 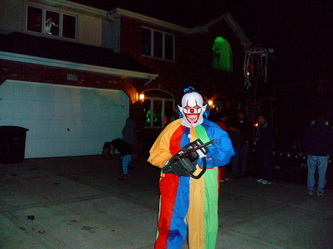 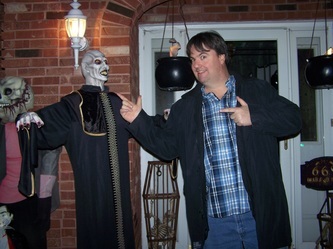 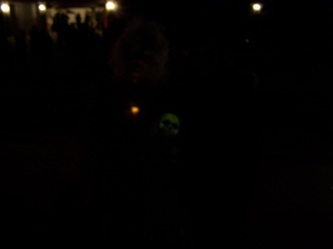 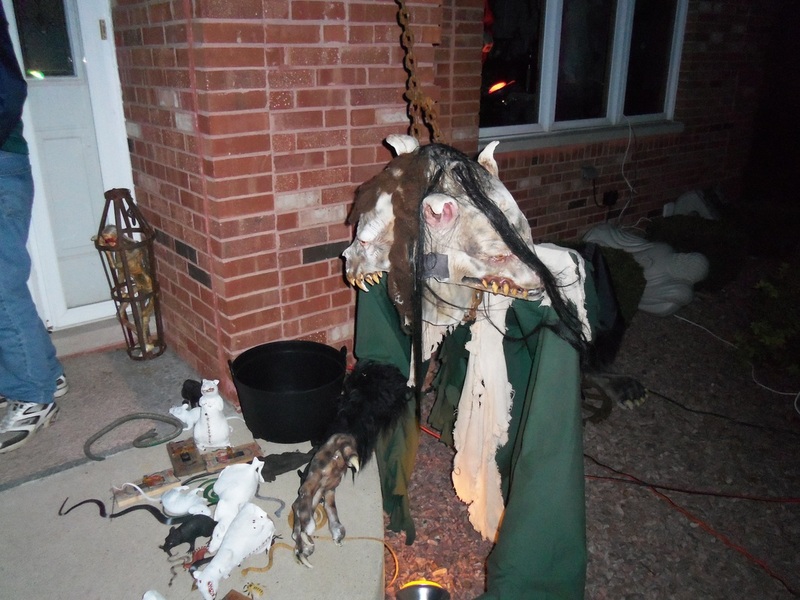 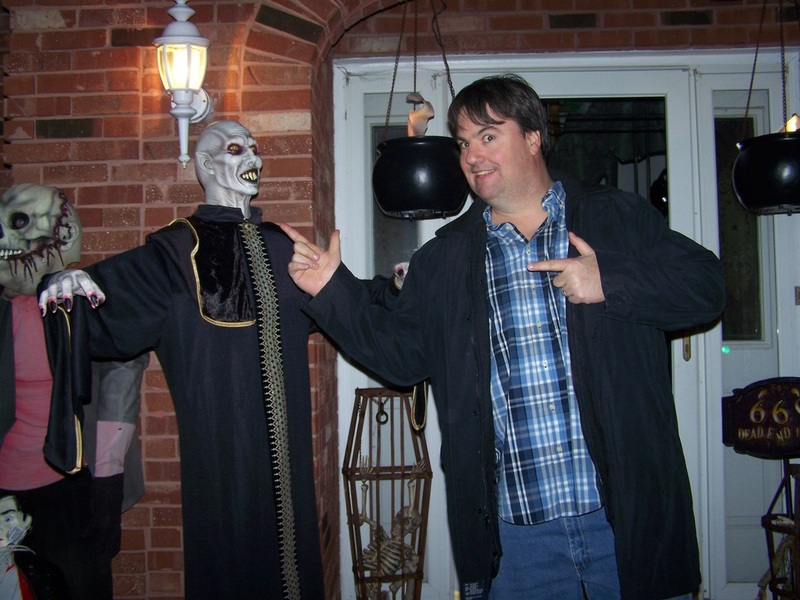 Fear on Fiona is another in a long line of great haunts and yard displays in the Mokena area.. 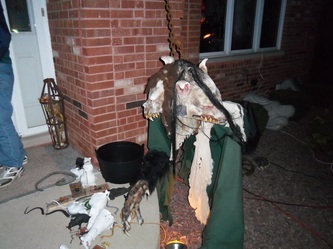 The Tourers have been visiting this area for several years now, and it never fails to prove most entertaining. 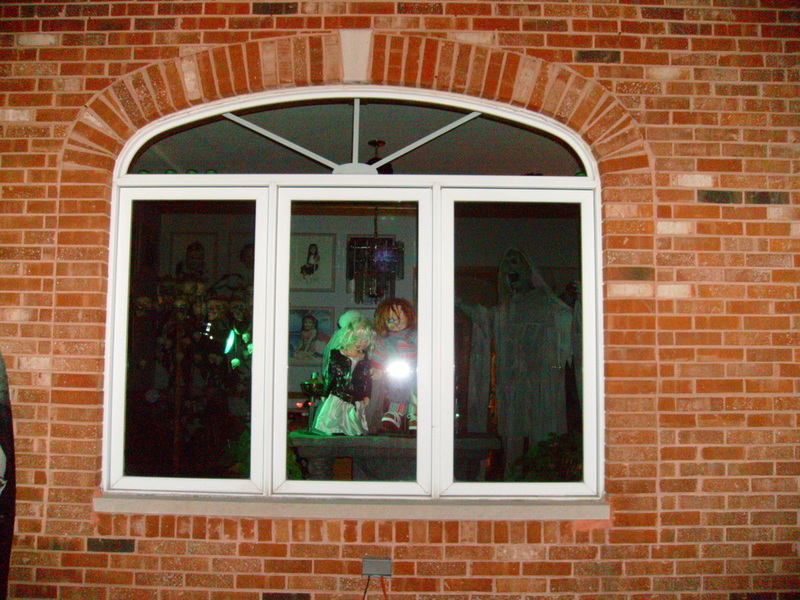 Many of the houses in Mokena not only have large front yards, but also large windows on multiple levels, and Fear on Fiona makes good use of both of these attributes. 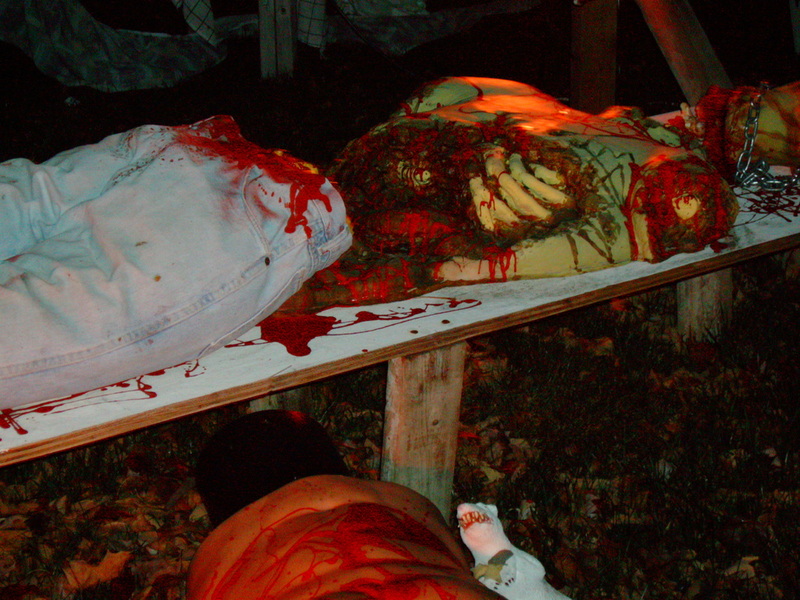 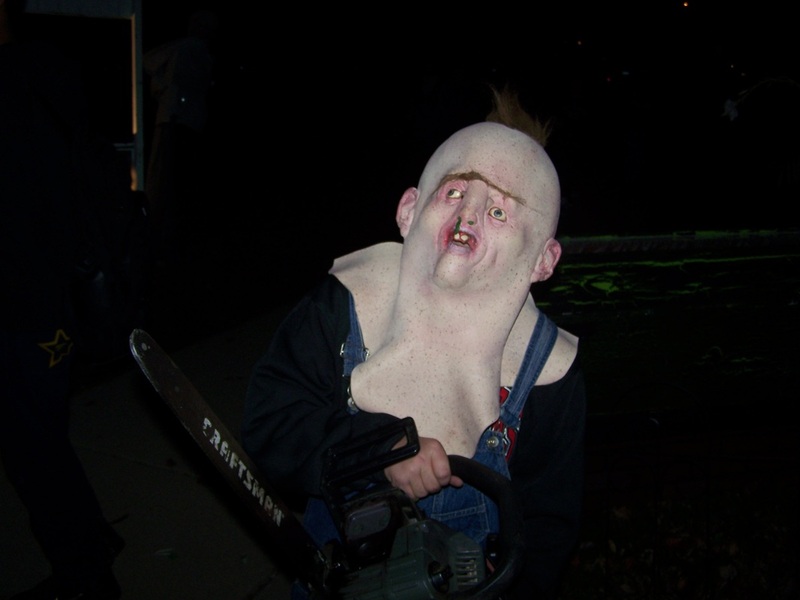 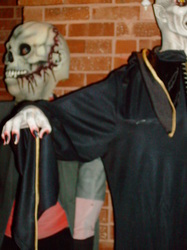 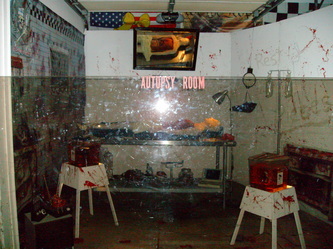 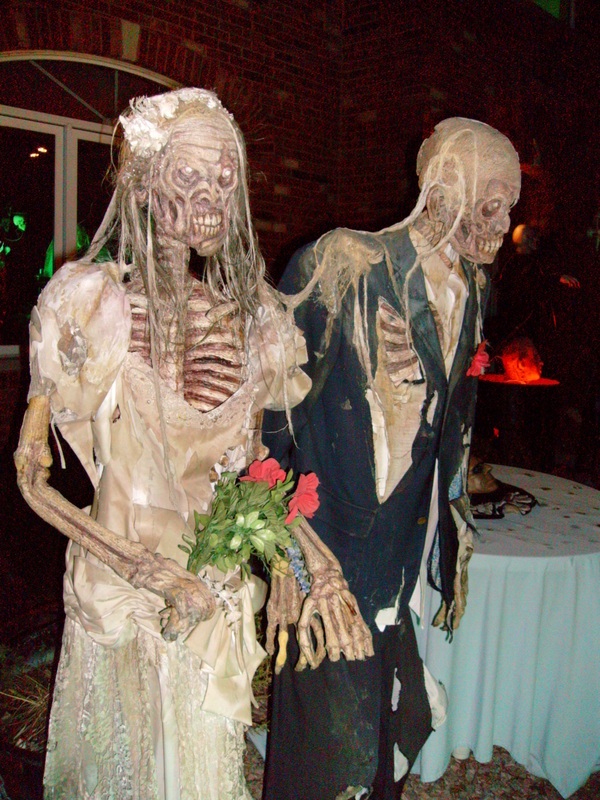 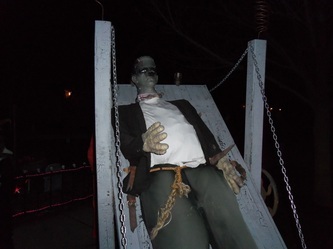 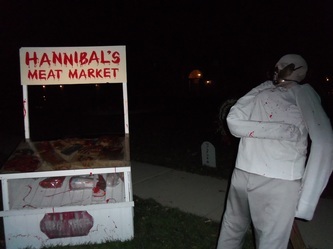 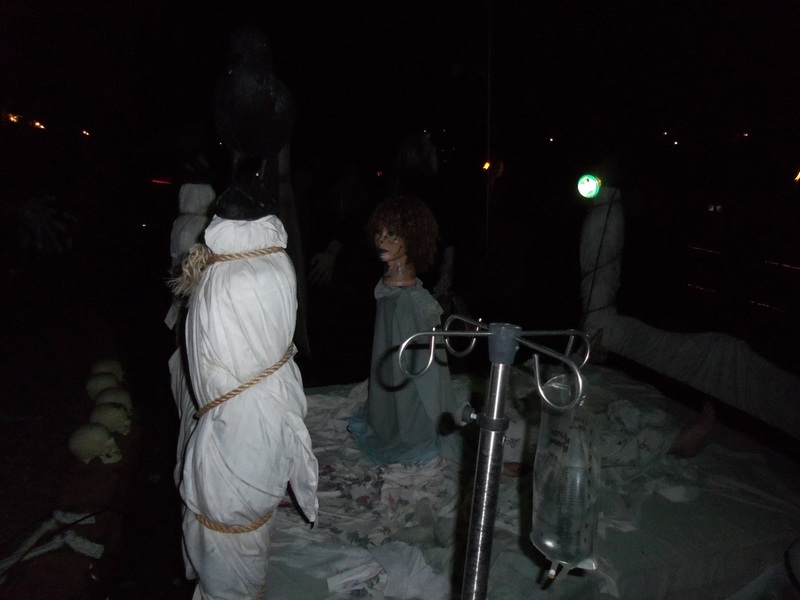 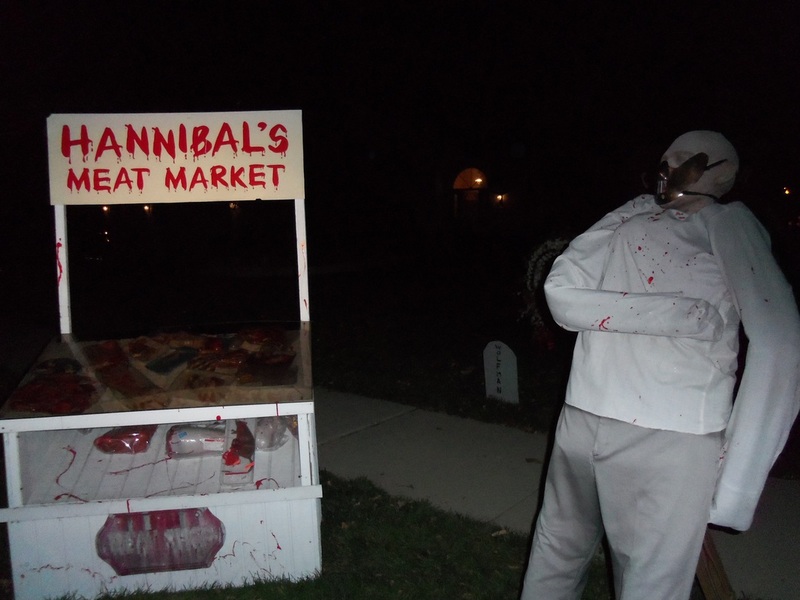 The display features numerous animated props based on popular horror tropes such as Frankenstein, horror movies like Saw and The Exorcist, and typical haunt fare like a cannibalistic butcher shop and an autopsy room. 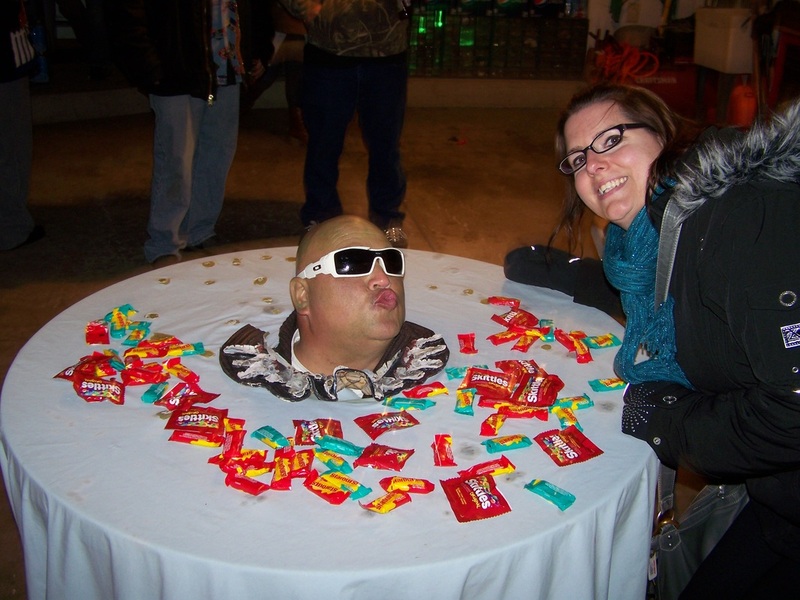 Additionally, Fear on Fiona features some creative and somewhat unusual scenes that one normally doesn't see at Halloween haunts, such as the crashed UFO complete with aliens. 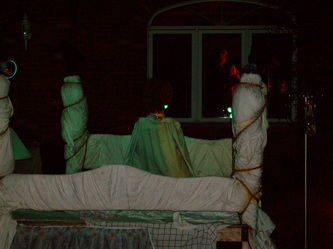 Most of these scenes feature animated props, although some are static. 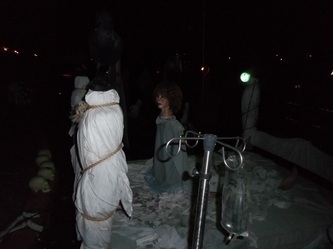 Some of our favorites include Regan MacNeil (or Exorcist fame) on her padded bed, complete with spinning head, the not-quite-completely-deceased newlywed couple that move towards you when a hidden switch is activated, and the creepy Saw guy on a moving tricycle. The garage is decorated like a full autopsy room with vials full of organs and a partially dissected body on a slab. 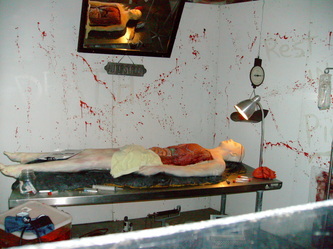 While visitors cannot enter the garage due to a plexiglass barrier, a cleverly positioned mirror allows visitors to view the body's innards in all of the gory detail. 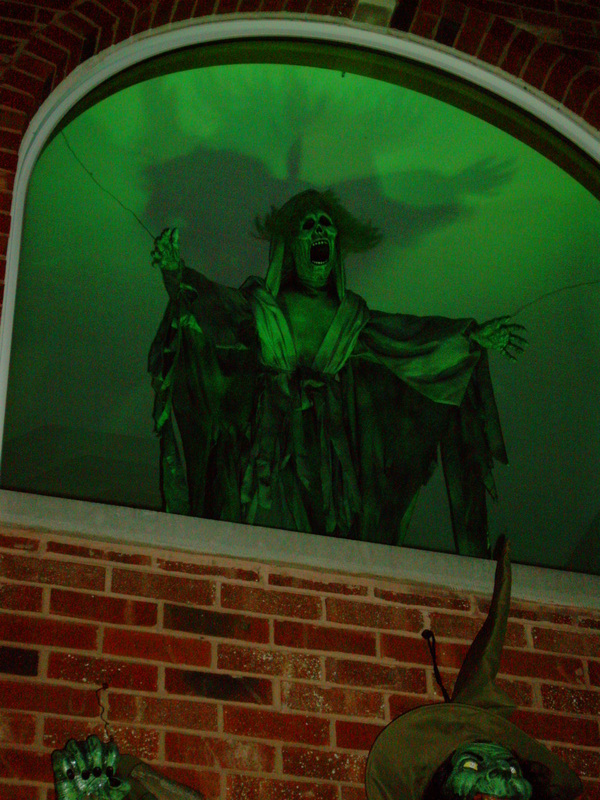 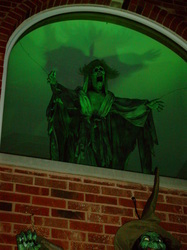 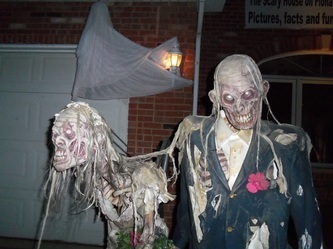 A large display at the very front of the yard features the Frankenstein monster and his bride, and each of the many large windows is contains at least one life-size prop. 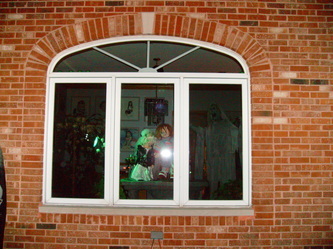 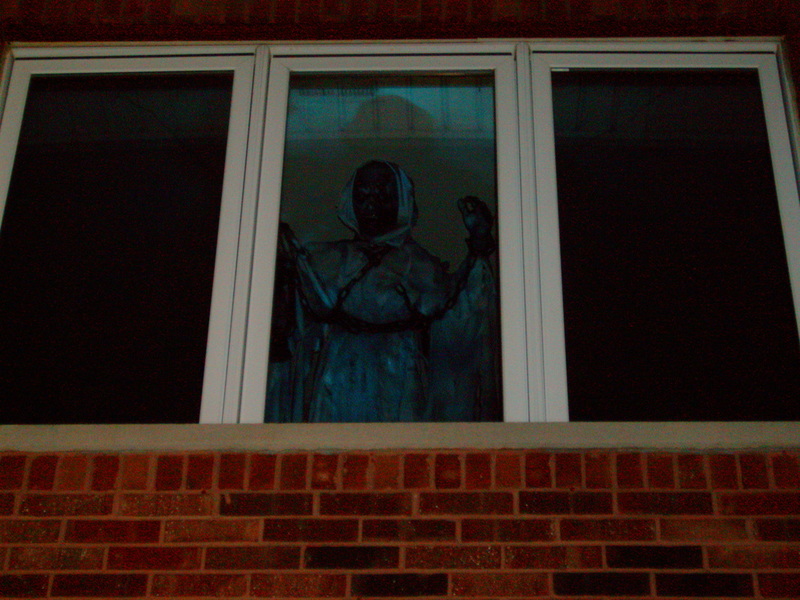 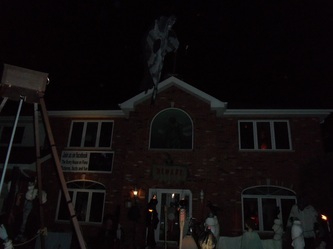 Our favorite has to be the creepy flying ghoul in the top center window, although every window has a good one. 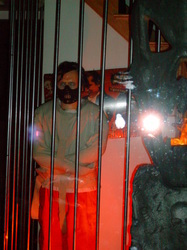 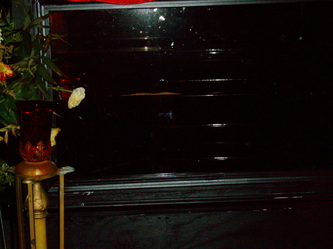 Visitors brave enough to approach the front door can peek in and see a life size animated Hannibal Lechter in a cage as well as other props inside the house. 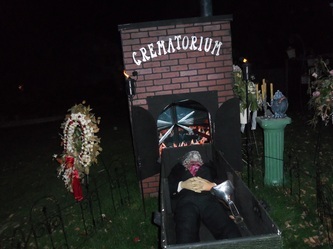 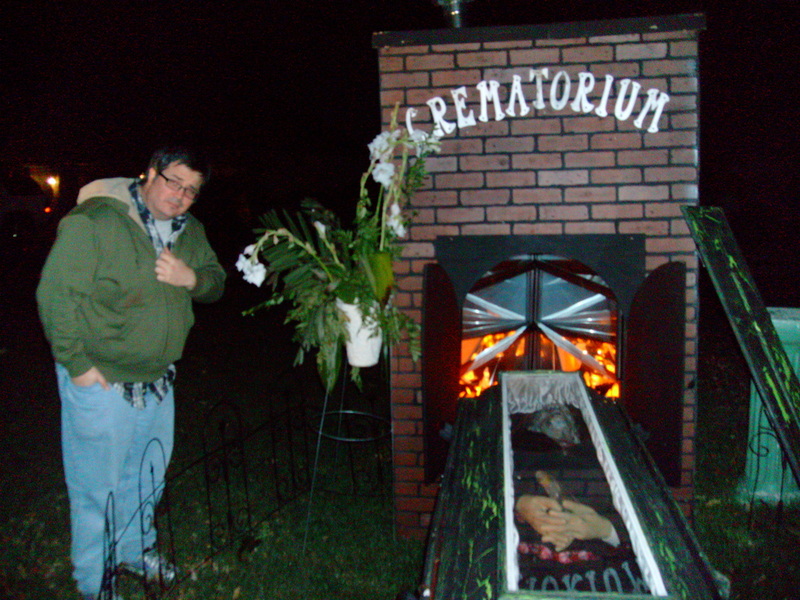 One of the most creative setups has to be the crematorium display.. 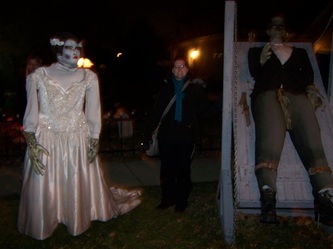 While one might think that such a display would be common at Halloween haunts, it really is not, so seeing one is a novelty, and Fear on Fiona's is extremely well done. 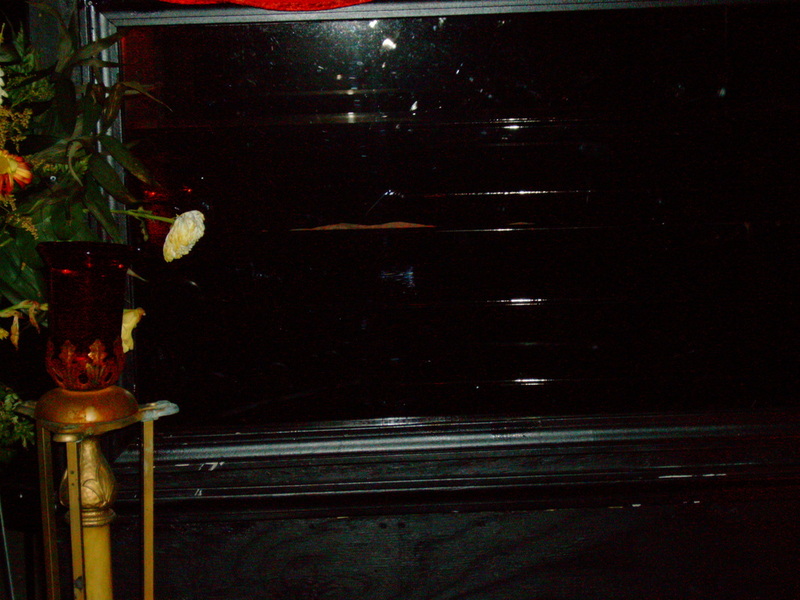 It features a body in a coffin, waiting to enter the furnace, surrounded by flowers as if at a real funeral. Peering through the furnace doors, visitors can see the flickering flames awaiting their prize. 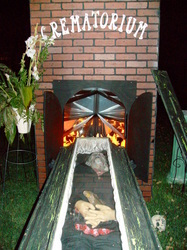 Through the clever use of mirrors and air, the flames actually seem real enough to burn you if you get too close. On certain nights, Fear on Fiona is supplemented with live actors. 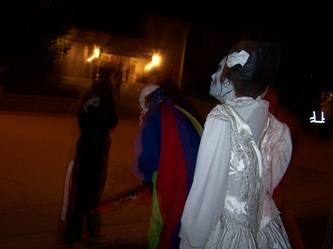 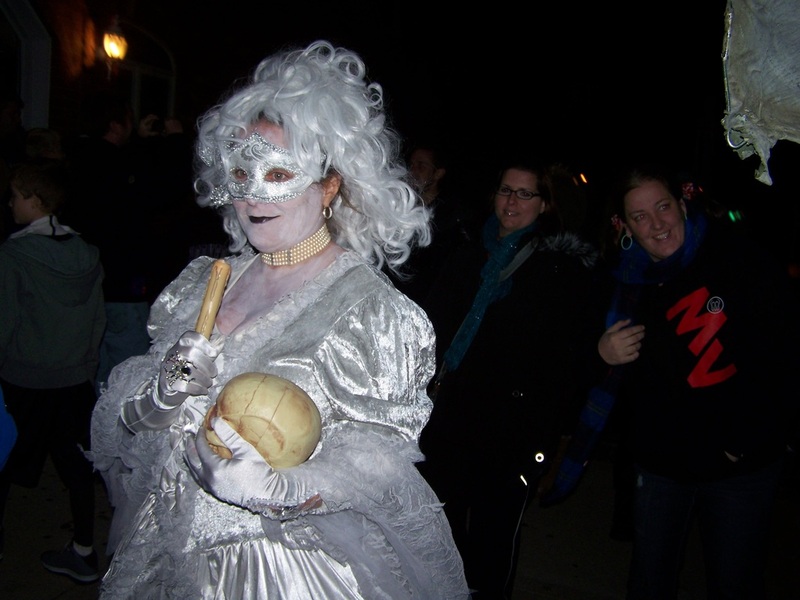 2012's included a creepy Marie Antionette clone, a inbred mini-freak with a chainsaw, a winged ghoul on stilts, and the obligatory crazy clown. 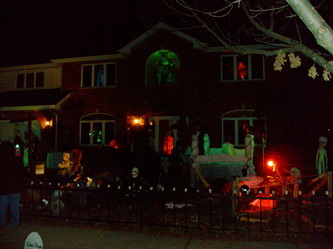 Each of them added to the already good atmosphere. 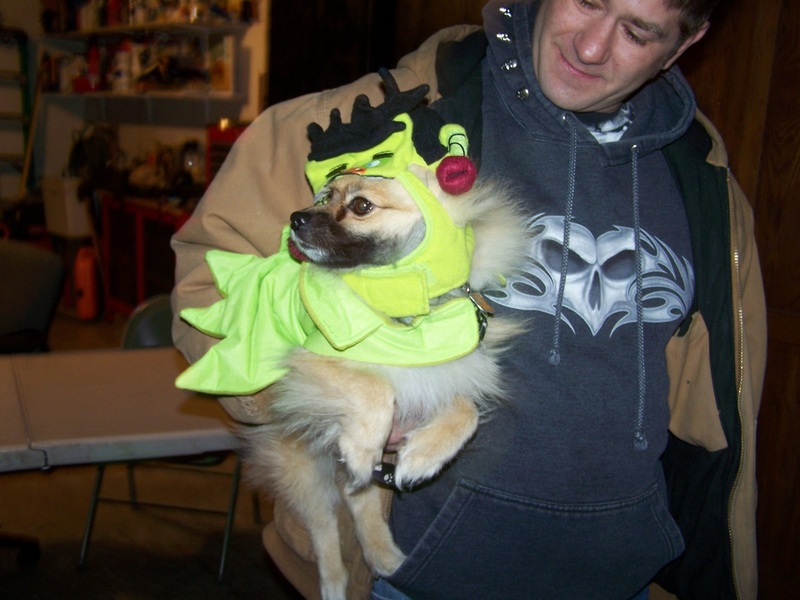 Overall, Fear on Fiona is a good time, and a good place to visit with the entire family. 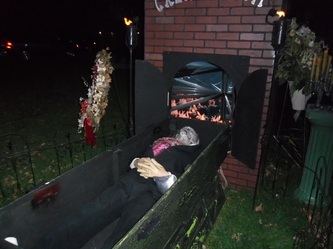 Although there are some scary setups, the display is wide open so there's plenty of room for smaller children to run! 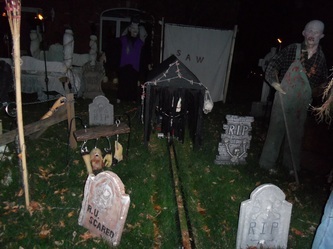 We highly recommend this display and look forward to seeing it each year. Also, if you visit this one on halloween night remember you may have to park a couple of blocks away, there are so many people the police actually have to block off part of the neighborhood for that night.